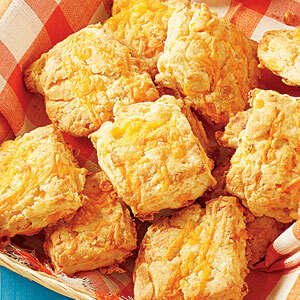 Cheesy biscuits with a surprise of corn. We love these with soup, and especially chili. 2. Pulse flour and butter in a food processor until butter is pea-sized. Transfer to a large bowl; stir in corn and 1 cup Cheddar. Add cream; stir until just combined. Dust hands with flour and knead dough five or six times in the bowl. 3. Transfer dough to a lightly floured work surface and pat with floured hands into an 8-inch square. Cut into 16 squares. Place on lined sheet; sprinkle with remaining 1/4 cup Cheddar. Bake until golden brown on top, 18 to 20 minutes. Serve hot or at room temperature. Store any leftovers in an airtight container in the refrigerator for up to 2 days.